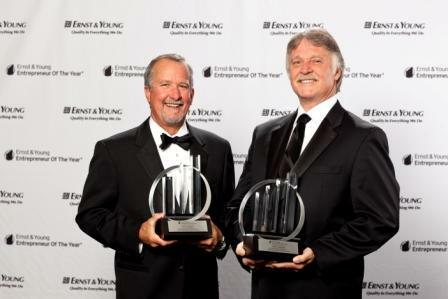 Global's John Graham and Tim Beaver receive Ernst & Young Entrepreneur Of The Year Award - Global Diving & Salvage, Inc. Global Diving & Salvage, Inc. is pleased to announce that Tim Beaver, CEO and John Graham, Chairman were recently made proud recipients of the Ernst & Young Entrepreneur Of The Year® 2011 Pacific Northwest Award in the Transportation and Logistics category. Selected by an independent panel of judges, they were presented this honor at a gala on June 10, 2011 at the Sheraton Seattle Hotel & Towers. Ernst & Young LLP established this award to recognize outstanding entrepreneurs who demonstrate excellence and extraordinary success in such areas as innovation, financial performance and personal commitment to their businesses and communities. The Ernst & Young Entrepreneur Of The Year Awards Program celebrates its 25th anniversary this year. Past award winners include Howard Schultz of Starbucks Coffee Company, Pierre Omidyar of eBay, Inc., Maxine Clark of Build-a-Bear Workshop, Tom Adams of Rosetta Stone Inc. and last year’s national winner, Howard Lutnick, Chairman and CEO of Cantor Fitzgerald and BGC Capital Partners, Inc. Global Diving & Salvage, Inc. congratulates Tim Beaver and John Graham for their inclusion into this prestigious group of business leaders and recognizes their hard work over the past thirty years, elevating Global as a leading provider of marine construction and infrastructure support services in the United States, and an internationally recognized casualty responder. Global Diving & Salvage, Inc. is based in Seattle,WA with additional offices in the San Francisco Bay area (Rio Vista and Richmond), Anchorage, AK and Houston, TX. Founded in 1979 as a diving and marine contractor, services include; Commercial Diving, Marine Construction, Casualty/Emergency Response, Upland Remediation, Marine Environmental Services and Offshore Energy Support. Capabilities include saturation dive systems (to 1,000 feet), mixed gas/surface diving, remotely operated vehicles, marine salvage and emergency response. Ernst & Young Entrepreneur Of The Year® is the world’s most prestigious business award for entrepreneurs. The unique award makes a difference through the way it encourages entrepreneurial activity among those with potential, and recognizes the contribution of people who inspire others with their vision, leadership and achievement. As the first and only truly global award of its kind, Entrepreneur Of The Year celebrates those who are building and leading successful, growing and dynamic businesses, recognizing them through regional, national and global awards programs in more than 140 cities in more than 50 countries. Founded and produced by Ernst & Young LLP, the Entrepreneur Of The Year Awards are pleased to have the Ewing Marion Kauffman Foundation as a national sponsor. In the Pacific Northwest, local sponsors include ADP, Union Bank, Seattle Business, The Big Picture Film Video & Arts, and Scherzer International. Ernst & Young refers to the global organization of member firms of Ernst & Young Global Limited, each of which is a separate legal entity. Ernst & Young LLP is a client-serving member firm of Ernst & Young Global Limited operating in the US. For more information about our organization,please visit www.ey.com.